Have you suffered from sudden spasms, or tightening, of muscles in the calf (sometimes in thigh and foot) at bedtime or rest? There is a chance you might be suffering from Nighttime Leg cramps. A cramp pain typically lasts a few minutes. In some cases it lasts just seconds, but in some cases it lasts up to 10 minutes. The severity of the pain varies. The muscle may remain tender for up to 24 hours after a leg cramp. Leg cramps usually occur when you are resting – most commonly at night when in bed. Common causes of skeletal muscle cramps include muscle fatigue, heavy exercising, low sodium, and low potassium. Smooth muscle cramps may be due to menstruation or gastroenteritis. Medications like, antipsychotics, birth control pills, diuretics, statins, and steroids. Exposure to extreme temperature conditions. Prolonged standing or sitting on a hard surface, or putting legs in awkward positions while sleeping. 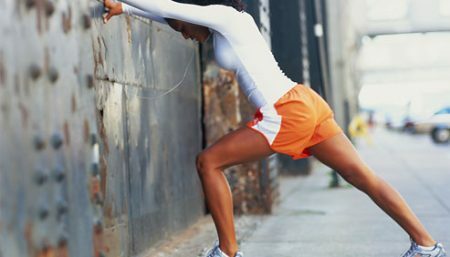 Stretching may be helpful in treating simple muscle cramps. With exertional heat cramps due to electrolyte abnormalities (primarily sodium loss and not calcium, magnesium, and potassium) appropriate fluids and sufficient salt improves symptoms. Always warm up before your workout to ease your muscles into the routine. Wall Push-up: Stand about 2 ft (0.6 m) from a wall, lean forward against the wall. Keep the knee of the affected leg straight and the heel on the ground. Do this while you bend the knee of the other leg. This puts pressure across the back of the calf. Foot Flexion: While sitting, straighten your leg and flex your foot up toward your knee. It may help to place a rolled towel under the ball of your foot and, while holding the towel at both ends, gently pull the towel toward you while keeping your knee straight. One Step Stretch: The step stretch can be done on a stair, aerobic step or the back of a weight-lifting machine. Place the balls of your feet on the step with your heels hanging over the edge. Slowly lower your heels toward the floor as far as possible so your toes are pointing up. Once you feel a strong stretch in your calf muscles, hold the stretch for 30 to 45 seconds. You can also do this stretch one foot at a time. If you do it this way, make sure you are close to a wall or chair to hold on to for balance if need be. Downward Facing Dog: From a position of all fours, lift the buttocks up toward the ceiling. Elongate the spine, and straighten the knees, and push the heels toward the floor as much as you can without forcing. Lift the wrists. Move the abdominal muscles in and keep them firm; drop your head toward the floor and let it hang loosely. Release after three breaths. Performing muscle stretching exercises 3x a day plus calf-muscle stretching with wall push-ups at bedtime will help minimize muscle cramp. Besides try applying warm compress over the commonly-affected muscles for 10-20 minutes before going to bed; use a foot board to simulate walking even while recumbent and prevent awkward positioning of the feet during sleep.